The head of insects is specialized for food gathering, sensory perception and neural integration. This makes sense because insects are bilateral, just like some other animals like dogs and cows, and the head goes first into the environment. This is in contrast to a creature like a jellyfish, which has radial symmetry! The structure of the mouthparts, which gather the food, differs among insect types because insects eat a wide variety of foods (flower nectar, leaves, other insects, human blood!). The head also has sensory structures including large compound eyes (see How to not get eaten if you are an insect! for a discussion about how compound eyes work) and antennae. The antennae are sensitive to touch, smell and in some cases even sound. Insects have brains just like us, although theirs are a bit smaller. The nerves of the insect carry the information received from the sense organs to the brain where it is integrated, just like what our brains do with sight, sound, hearing and taste. 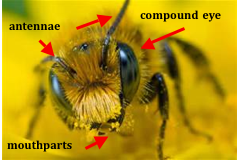 Figure 8.3: The head of a honey bee. Notice the little yellow balls near the mouthparts. Can you guess what they are?